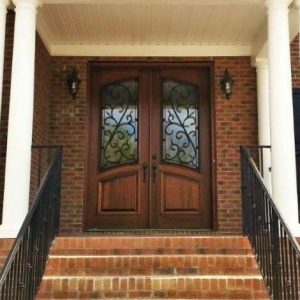 Your custom door from Southern Front Door is beautiful but did you know it can lower your energy bill? How Your Custom Door Can Save You Money is attractive because it can help reduce one of the most significant bills in your house: The electricity bill. The Outside Air Stays Outsides. The Q-LON weatherstrip restricts the outside elements from entering your home. When your cooling or warming your home, your AC Unit is using energy that you will pay for on your monthly bill. However, if your door isn’t properly sealed, the outside elements can rush under your door, and your unit will consistently work to maintain a certain temperature. As a result, your unit has to unnecessarily use additional energy to make your home comfortable which leaves you with a hefty energy bill. Sealing All of the Gaps. The Q-LON weatherstrip is available to accompany the most common door material. The weatherstrip can seal the tiniest door gap and can be cut to any desired length to fit smaller doors and spaces. The energy saving weatherstrip is made of polyethylene-clad urethane foam and a special backing for certain door types. The strips are currently available in wood, metal, and vinyl. Southern Front Doors have been in the business for twenty years. Therefore, we can help our clients find the best door for their desired curb appearance and their overall budget. For more information, contact us at 281.890.5860 or visit our website here. Set your appointment today and enjoy your door tomorrow!! !